The Prospector trail is located at the northern end of Moab, Utah. 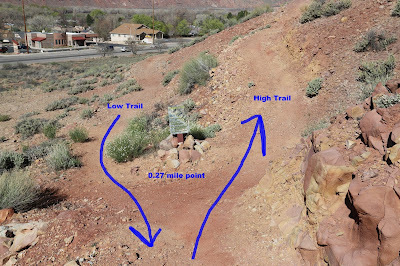 The trail travels across private property between the Moab Zipline and the Rock Shop with a trailhead on each end. The middle of the trail is split into a high and a low section giving users a choice of workouts and scenery. This post begins at the Rock Shop end of the trail where it takes the high route to the Moab Zipline trailhead and returns via the low route. The trail begins by ascending several switchbacks as it gains a little elevation on the hillside above Highway 191. After leveling off somewhat the trail begins traversing around the contours of the mountain as it works its way north. The trail continues with few if any technical difficulties. The only real technical spots are the initial switchbacks and some loose rock in places. Near the quartermile point the trail splits into the high and low routes. 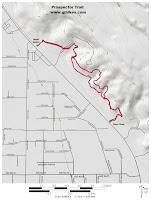 A glance at the trails profile map shows the difference between the two routes. 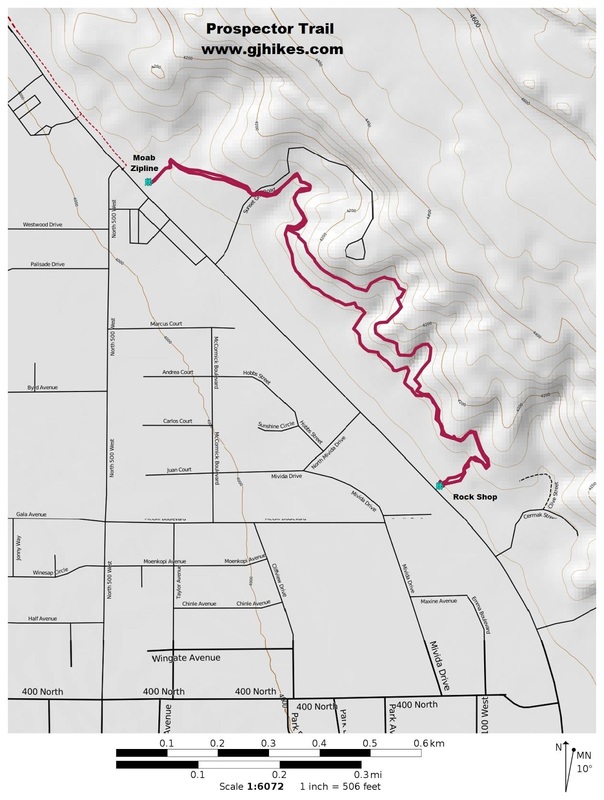 The high route is just steep enough to get a bit more of a workout but nowhere near as intense in comparison to the climbs on the nearby Slickrock Bike trail. Because the high route works its way further into each of the side drainages it is quite a bit longer than the low route. The two routes rejoin near the 3/4 mile point. From here you can see most of the rest of the route to the Zipline end of the trail. 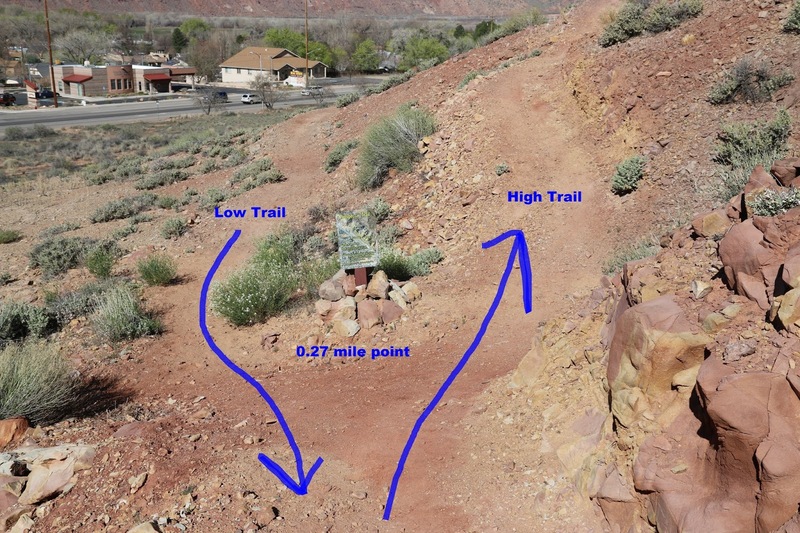 At the Moab Zipline trailhead the paved path begins that leads to the Lions Park Bike Hub and all points beyond. Most everyone that we saw on the trail seemed to be beginning from either their home or one of the campgrounds or hotels. Going back on the low trail is shorter and easier but it still has to deal with the combined portions that involve hills on both ends. 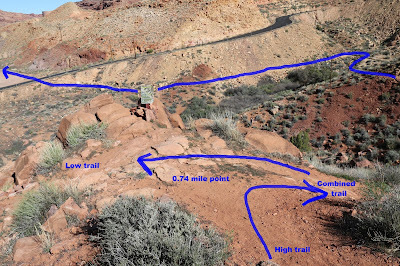 The Prospector is a good trail that is close to Moab where you can get a good workout and have some fun doing it. The trail blends in so well with the landscape that is is barely noticeable unless you happen to see someone on it. With its close location to town it is easy to get to from any of the motels or campgrounds without needing to drive to the trailheads. If you would like to see it for yourself then all you have to do is grab your bike or 'Take a hike'.